Thursday night saw 7 boats out for the final races of the series. 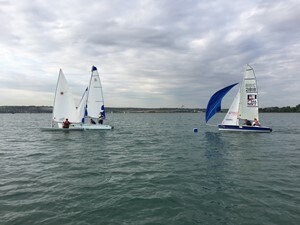 Lee Bichard of the RN Watersports Centre (RNWC) kindly ran the two races in a light South Westerly breeze. With High Water half way through racing the boats were able to race short lap courses over the mud towards UHAF. Pat Smythe (Bosun) scored two decent results as did Lt Alex 'Bumpercar' Thompson despite numerous infringements. Lt Cdr Ian Watson ventured out of the Fusion and into the Laser 2000 for the evening for something a little more exhilarating.